Four cords of firewood are in the garage; the wood/oil furnace is cleaned; the firebox in the furnace was rebuilt; the CO detectors and fire detectors are fixed and the chimney will be cleaned tomorrow. Fire extinguishers still need to be purchased. The windows are nearly all sealed with plastic. We are ready and feeling cozy. We will still be using oil and are hoping that the price of it is not prohibitive this year. But whatever the price, we will only deal in cash and we will come out of the winter without debt. We are not suffering as other families are and I am feeling blessed. Click on the photo to view it full-size in a new window. I'm happy for you that you've been able to make the necessary preparations with the changing seasons. I hope the cost of oil remains affordable. Winter preparations complete are certainly a blessing! Enjoy that snow for me. I miss the kind of snow we had when I lived in upstate New York or southeastern Idaho. You are very well organised, Andree. I'm with you, pay cash for everything, which is what I do, too. That's the best way to weather the current financial crisis. Have a lovely cosy and debt free winter. Good for you, friend! 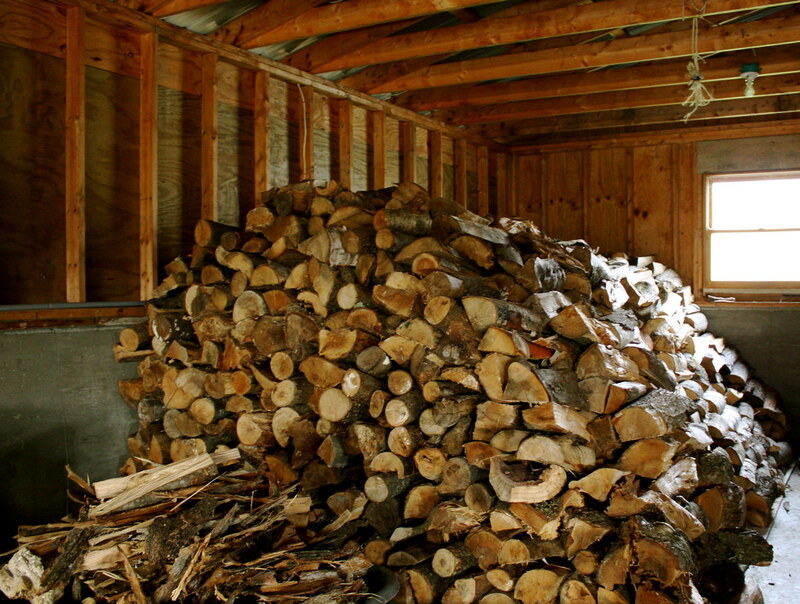 I have always felt a sense of comfort and peace when I have looked on a wood pile. They suggest care, planning, abundance, and something sure. Stay warm! 4 cords of wood that sure is a blessing. Have a comfy and cozy winter! Oh my, I feel like I'm so far behind now. I'm still waiting for a friend to stop by and help me relocate my wood furnace. I did however finally finish moving and stacking 10 cords of wood. The windows I'm holding off on since it's probably a little bit warmer here, but I do need to get moving soon. This will be my first full winter in VT, so I'm working hard to get everything ready before the temps drop. Oh-oh! Winter is a-comin'! I like your attitude towards finances. It's the ONLY way to go. Being ready for the unforeseen events is one good way to survive beautifully. Paying in cash is even nicer. That is what we usually do. We do not use plastics and we try to live within our means. its been a while since I have visited you. My apologies.